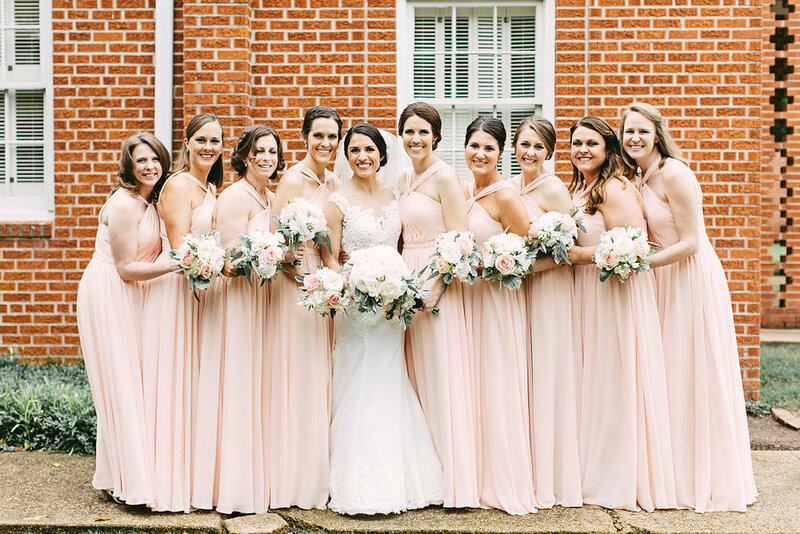 Lovely Maggie Louise Bride Sarah married her sweetheart Beck this past April + it was a stunning day that makes us all swoon here at Maggie Louise! She stunned in her Anne Barge bridal gown and veil. We couldn’t be happier for this sweet couple! How did y’all meet? Tell us your love story. : Beck and I met online; though, he likes to tell people we met in the grocery store or at church! ;) We first laid eyes on each other at Hog & Hominy and had the best first date we can both remember. I was instantly drawn to Beck because our conversation was so easy, and he had me laughing non stop. We closed the place down and have been inseparable ever since. Beck is the most kind person I have ever met and was so easy to fall in love with. He loves me better than anyone. How did he propose? : In August of 2016, we spent a week out in California. We had planned the trip for months, with the highlight (or so I thought) being seeing Adele in LA. The plan was to leave LA and spend two days driving along the Pacific Coast to San Francisco. At the end of our first day of driving, which also happened to be my birthday, Beck took me to dinner at a small but delicious Italian restaurant in a tiny beach town called Cayucos. After dinner, Beck started telling me how much he loved me and how thankful he was to have me in his life. I thought this was a "it's your birthday / I love you" speech, but at the end, he asked me to marry him. I was COMPLETELY shocked, and truly didn't see it coming until he pulled the most beautiful ring I've ever seen out of his pocket. I remember screaming and asking if he was serious - I was just in such disbelief. I knew we would get married, but I thought traveling with a ring would be WAY too stressful, so I didn't expect it to happen while we were out of town! I'm such a planner, and still can't believe he pulled this off without me having the slightest clue. We spent the rest of the night taking pictures and calling our families and closest friends. I remember it like it was yesterday! The next day, we drove the rest of the way to San Francisco, through beautiful Big Sur, and I remember feeling happier than I've ever felt in my life. I was so excited to be engaged to Beck, we were surrounded by the most incredible scenery (GO to Big Sur if you haven't been!) and I was living in sheer bliss and joy of what had just happened. I don't think I stopped smiling for the rest of the trip. What was your most memorable moment about your wedding day? : I remember when the doors opened and I started my walk down the aisle, seeing Beck, and being totally overwhelmed with emotion. My groom - who I waited forever for - was at the end of the aisle. My dad walking me down the aisle. And surrounding me were the people I love most in this life. It was incredible. I literally had to take deep breaths because I saw so overcome! It was joy and thankfulness and relief and excitement all bundled together. Like nothing I have experienced before. What was the design inspiration or theme for your wedding? Why was this special to you as a couple? : Unlike most other brides, I never had a vision of my perfect wedding day. So, I was open to consider anything! Our venue, Teton Trek at the zoo, ended up being really special because Beck and I both love the outdoors, and he actually lived in Jackson Hole after school. It was the perfect mix of elegant and rustic, just like us. Best advice you received while planning for marriage or your big day. : Beck and I did marriage counseling to help prepare for our marriage. I would highly encourage engaged couples do the same. We met with a couple at our church and had six sessions where we discussed all the "hot topics" of marriage. This helped us prepare for some of the situations we'd encounter in marriage, but also got us excited about our life as a married couple. The best advice I received as a bride was to let other people help me (which is HARD for me because I'm such a planner!). I had several people willing to step in and help - my mom, my sisters, a few of my best girlfriends - and Beck was also there every step of the way. There are so many small, minute tasks and details, and having people take those off my plate was such a relief. Our biggest help was Amy Tyler, our wedding planner. She was absolutely incredible, and I cannot recommend her enough. My parents and I could really enjoy the wedding planning process because Amy was on our team. What advice would you give to someone currently planning his or her wedding? : Besides hiring every single one of our vendors!?! ENJOY the wedding week and wedding day. Try not to stress, and realize that once your wedding day arrives, nothing can stop you and your groom from having literally the best day of your lives! Once our wedding week arrived, I was so chill. I even surprised myself! But, I truly soaked in every moment, enjoyed being with all our guests and especially enjoyed the sweet time with Beck. Things didn't go 100% as planned on our day, but it truly did not matter. Favorite part of the wedding planning process? : Our "wedding squad!" Beck, my parents and I all agree that we had THE BEST wedding team. Everyone was actively involved (vs. just being order takers) and sincerely wanted me and Beck to have the most incredible day. People were open to others' ideas, even if it wasn't their area of expertise. The team could not have gelled more perfectly! We really missed working with them once our wedding day was over. What made you choose Maggie Louise when searching for your gown? : For me, finding my gown at Maggie Louise was a no brainer. I had heard countless rave reviews for Molly and her staff. I also know that Molly has exquisite taste in design, so was confident that not only would she have a large selection of beautiful gowns, but that I'd find something perfect for me. Also, as a native Memphian, I am so proud that we are the home of Maggie Louise, a well-known destination for brides! My experience at Maggie Louise did not disappoint... it was absolutely incredible, I felt like a queen, my family had the best time, and I walked out with a STUNNER dress. Tell us anything extra you'd like to share about your journey down the aisle + all that lies ahead. : Our wedding day was - hands down - the best day of our lives. I flip through my wedding photos all. the. time. and I always get choked up because it brings back the best memories that I have (and also because I'm sad I can't relive that day!). As we approach our 1-year anniversary on April 22, I am SO excited for all the years that lie ahead. Beck is immeasurably more than I could ever ask for, and I'm so thankful that we'll share the rest of our days with each other!